It is vital to the future of this county that Polk voters decide to continue the half-cent sales tax for facilities construction. Full stop. Let me say it again, with italics: it is vital to the future of this county that Polk voters decide to continue the half-cent sales tax for facilities construction. One can choose from a massive buffet of numbers and reasons to illustrate why it’s vital. I’ll be doing that quite often as the November 6 referendum approaches. A desperately needed new high school in Northeast Polk, along with other desperately needed capacity. Elementary schools that relieve crowding at other elementaries — Chain of Lakes Elementary, for instance. Security upgrades and athletic field renovations. Millions and millions in maintenance projects deferred for years because we didn’t have money to do them. It’s the best way to help us avoid the air conditioning problems that have plagued Hillsborough County. And, if I have my way, resources to get creative about reducing busing and segregation — and improving how magnet and traditional schools affect each other. An independent Political Action Committee has been set up for individuals and organizations who want to contribute to the campaign of support. You can donate at this link. In an effort to put our money where the keyboard is, the Townsend household just gave $1,000. If you can contribute anything, please do. Everything counts. I also want to thank Hollis Hooks for prompting me. At the quarterly Polk Education Foundation board meeting last week, we had a discussion of the sales tax and the PAC supporting it. And at one point, Mr. Hooks, whom I don’t very well, said something both flattering and challenging to me. To paraphrase, it was: Billy, a lot of people read what you write. You haven’t done much on the sales tax. What’s up with that? And will you be writing about it? All I could really say in response was, “Yes, yes I will.” He was right. And it was a very useful reminder to me, as a writer and public figure. Just because I know my position so well and so openly that I take it for granted doesn’t mean that everybody else does. I talk to District folks about this human tendency all the time. So it’s important for me to own it, too. It’s important for the District as a whole — and for me as an individual — to imagine how people experience what we do and say. And how people experience what we don’t do and say. I also think, perhaps, an unspoken element of Mr. Hooks’ very fair question relates to how I see and perform my oversight and leadership role on the board. In short, is my public oversight writing compatible with full-throated support of the sales tax renewal? There’s a simple answer: Absolutely. 1000 percent yes. I think they go hand-in-hand. I hope voters feel comfortable supporting this continued investment in their own children because they can trust me to be honest with them about what’s happening at the District. I hope they feel that I am available to them — and that I take my oversight responsibilities seriously enough to make people publicly uncomfortable over them from time-to-time. Public support and constructive oversight are equal forces for good in my view. Board Chair Lynn Wilson is acting as the board liaison to the PAC and campaign. But I will support him however I can. If you want me to come speak to a group or make the case to someone one-on-one, call me at 863-209-4037. Heck, I’ll probably sing karaoke for you if it swings votes. It’s no secret that there are cultural, political, and generational differences on the Polk School Board and within the Polk School District. That’s hardly surprising; there are cultural and generational differences within Polk County, the state of Florida, and America as a whole. The politics and direction of public education in Florida are at a particularly acute moment of inflection and generational uncertainty. But within that reality, trust me when I tell you that nothing unifies all Polk board members — really all Polk public education stakeholders — like support for the sales tax renewal. The candidates for School Board, all of them, as near as I can tell, are similarly unified. And the sales tax PAC is full of community leaders who strongly supported my opponent in 2016. My reaction to that is: Great. Thank you. And thanks to Hunt Berryman for helping create these sales tax resources in the first place in 2003 and for lending his name and prestige to the effort to renew them. 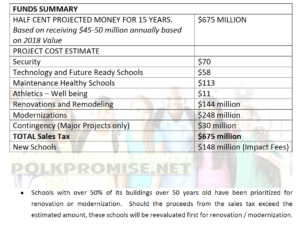 In large degree, that unity reflects the fact that this tax/investment is bigger than the School District or its political and operational leadership. Indeed, the School District is just the primary tool through which these resources are deployed. It can be shaped and reshaped over time. More importantly, through this tax, the community demonstrates the constancy of its commitment to facilities that keep kids safe and give them dynamic learning spaces. Indeed, until our state government comes to its senses, this is the only way for the Polk County community to provide adequate facility resources for its kids. The only way. Kelli Stargel is not going to do it. I wish I could say otherwise. This tax is a commitment to controlling as much of our own destiny as we can in this county. It belongs to our community. The resources the community creates for itself will still be providing for our kids if folks throw me — or anybody else — out of office. It’s a powerful statement of belief in the future. And I believe in the future.